I've just got to accept that we have a chocoholic dog! Lucy is the BEST DOG IN THE WORLD except for perhaps a little neurosis and a nose that can find chocolate....no matter where it is! Lucy is now 12 years old and I'm surprised that she has managed not to kill herself from all the chocolate she has eaten in her life. She is really smart and can sit, dance, bark, sneeze, rollover, go to her bed, shake, grin, and bow. Most of the time on command, but some of the time, when she is not sure...she will go through all of her tricks all at once, to get her treats. She is getting a little, shall we say...Plump? ..to avoid hurting her feelings. As my husband says, he has a happy dog and he doesn't care if she is fat or not! Her being chubby is not from eating chocolate, but if she had her way, she would like more of that substance any chance she gets. Because she is so smart, it has long been established that you cannot leave any sweets (mainly chocolate, but also gum) down in her space. Most of the time, we remember not to leave stuff in her range, but it never fails that we occassionally forget. Christmas and Easter are usually a given that some form of chocolate will be left where she can get to them. This has been going on since we got her and I can guarantee that every Christmas and Easter, that dog gets her chocolate! For years, I reminded the boys to "keep the candy away from Lucy," and for years, someone always forgot. 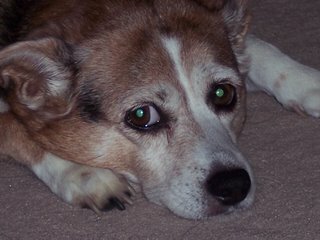 She has, on one occassion, even managed to get into the pantry and pull over a bag of chocolate chips. That experience was almost the deadly one, because she really got sick from the dark chocolate. My understanding is that the darker the chocolate, the more lethal it is to dogs. The other chocolate occassions are usually random occurrences, but there are many stories of Lucy unzipping my purse, pulling out everything in the purse to get to a chocolate mint that I had forgotten about. Almost every visit that mamaw makes to our house results in Lucy getting into her purse for the ever present gum! She is pretty amazing when it comes to UNZIPPING backpacks. There are numerous occassions that she would manage to get ahold of left over chocolate bar or gum or whatever else she smelled in the boy's backpacks that they had long forgotten about. 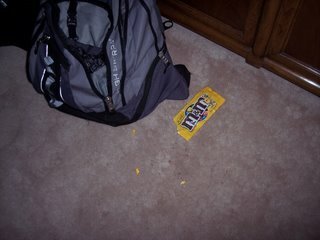 Jeffrey had left his backpack down on the floor and that little devil unzipped it for the M&M's she smelled. Jeffrey did not even remember that those were in there, so there's no telling how long they were in that front pouch. She is smart enough to know she is not suppose to get into things. When I came down the stairs, she was cowering on the stairs. I couldn't figure out if this was because of her normal "neurosis" or for some other reason. I though I better have a look around before I started working. As I walked around, she was like that game of hot/cold. When I went toward the kitchen...no real response from her. (colder) When I went toward the living room (the scene of the backpack), she cowered more.(hotter!) I happened to be working from home that day, and she stayed away from me all day. She always gives herself away with bad behavior because she won't come to greet us when we come in. One day she stayed upstairs for over an hour, before she would come say hello. You would think we beat her or something, but she is just neurotic and really doesn't like to be yelled at...if only the boys had been that easy when they were little! Even being a chocoholic, she still is the best dog...how can you not love that look on her face? It pretty much says: I know I've done something I shouldn't but I'm too cute to not love! she is a cute little thing isn't she?? Amazing what they can do when they want something isn't it? Poor little Lucy. I hope she continues to survive the chocolate treats and gum. Tasha is getting so she grazes the dry grass like she's a goat or a cow. I always stop her when I can but maybe she needs that hay in her diet. She always did eat green grass blades but she's worse since she has the renal disease and is limited to rx food and treets Makes it hard on us both! I believe that face is saying, "I sorry mama, but my tummy doesn't feel so good, please take care of me...and I'll have some more chocolate if you have it..."
It seems you got a SMART beagle. We have had (I have to figure this out) 12 beagles, most not too bright, all totally untrained. It sounds like you got the "gifted" one. We are currently down to four beagles, ranging in ages from 9 to 17. The oldest has doggie-dementia. He still dances in the backyard. Did you know that 12 isn't considered old for beagles? We love their singing voices too, except at two in the morning. They are special little dogs and each one possesses his/her own quirky personality.